Bert Corona (1918- 2001), was an icon of the California and Chicano left. Corona's first wife, Blanche Taff, died in 1993. A year later, he married Angelina Castillo, who still works for Hermandad as its director of affordable housing. In addition to his wife, he is survived by sons David Corona, of San Luis Obispo, and Frank Corona and Ernesto Corona, both of Los Angeles; daughter Margo De Ley of Chicago. Bert Corona was born in 1918 in El Paso, Texas, at the height of the Mexican Revolution. His father was a member of the Partido Liberal Mexicano, an anarcho-syndicalist group. He was murdered when Bert was five. In the 1930s Corona was close to International Longshore and Warehouse Union leader and secret communist Harry Bridges. After Corona was fired from ILWU position union over an internal dispute, Harry Bridges, also a major figure within the communist dominated Congress of industrial Organisations (CIO) offered Corona a job as a CIO organizer. In 1937, Corona began working with labor leaders such as Josefina Fierro, Lloyd Seeliger and Bridges, and many others who provided a political education. He organized with the Longshoremen's Union in Los Angeles. With labor organizer Luisa Moreno, he helped shape the National Congress of Spanish Speaking People. In the 1940s, he was elected President of Local 26 of the Longshoremen's Union. Later, he joined La Asociacion Nacional Mexico-Americana (ANMA), which was one of the few organizations protesting the "McCarthy hysteria of the early 1950s". At Saturday evenings A Night At Epiphany honoring Dolores Huerta, Conrado Terrazas veterano del movimiento and head field deputy for Gil Cedillo, Dolores, my brother Ricardo F. Munoz and. Behind us some of the photo exhibit curated by Jimmy O'Balles and me as historian. If you look closely you can see Ed Roybal between Conrado and Dolores with the 1935 Spanish Club at Roosevelt with Roybal as president, then between Dolores and Ricardo is a late 30's event of the Mexican Youth Conference with Bert Corona and my uncle Felix Gutierrez and behind me a photo of a state Community Service Organization leadership, on my right you can see Saul Alinsky, also in photo Roybal, Fred Ross, Cesar and Helen Chavez, Herman Gallegos and others. A social event of the Southern California Mexican American Movement which promoted college and community involvement in the late 30's into the the 40's, This circa 1940. My uncle Felix Gutierrez is seated on the floor edited the publication, the features editor was Bert Corona top right. During the 1940's, Corona was an organizer for the International Longshore and Warehouse Union (ILWU) and was identified in Congressional testimony as a Communist Party USA member inside that union. The list of "sponsors" of "A Call" for a founding conference of the Communist Party USA front National Alliance Against Racist and Political Repression May 11-13, 1973, included Bert Corona, Executive Secretary, Casa Hermanidad,. Corona helped elect the first Los Angeles Chicano city councilman, Ed Roybal. David Bacon met Coleman Persily, because they were both friends of Bert Corona, the founder of our modern immigrant rights movement. In the 50s Persily and Bert Corona helped run the campaign for Ed Roybal, the first Chicano elected to Congress from California since 1879. That was a harbinger of the end of the Yorty years, of the hatred of Latinos seen in the Zoot Suit riots and the Sleepy Lagoon prosecution, and of LA's reputation as the home of the Open Shop. As we know today, much bigger political changes were to come, and people like Henry and Coleman helped set the stage. Coleman went on to help organize the Canal Street Alliance, which today is Marin County's main immigrant rights organization. Corona helped establish chapters of Saul Alinsky's Community Service Organization, and in doing so, he met a young organizer named Cesar Chavez. In 1964, Chicano civil rights movement activists like Bert Corona, Ernesto Galarza, Cesar Chavez, and Dolores Huerta forced Congress to end the guest worker "bracero" program. The next year, Mexicans and Filipinos went out on strike in Coachella and Delano, and the United Farm Workers was born. That year, in 1965, they went back to Congress. Give us a law, they said, that doesn’t make workers into braceros or criminals behind barbed wire, into slaves for the growers. In 1959 Ed Roybal, Communist Party USA member Bert Corona and Eduardo Quevedo met in Fresno to form the Mexican American Political Association. Corona was one of the founders of the Mexican American Political Association in 1960, an organization whose mission was the support and promotion of Mexican American candidates within the Democratic Party. The young organization helped set up the Viva Kennedy clubs that, for the first time, brought large numbers of Mexican Americans into a Presidential campaign. In the 1960s Corona served as co-chair for both Lyndon Johnson's and Bobby Kennedy's presidential campaigns in California. Corona ran the Mexican American Political Association and, in 1965, California Governor Edmund "Pat" Brown appointed him to the California Civil Rights Commission. Corona delivered a nationally televised address at the violence-prone 1968 Democratic Party convention in Chicago, but then broke with the Democrats and backed the separatist La Raza Unida party. It was based on the irredentist concept of Aztlan, the notion that an occupied Chicano nation in the southwestern U.S. needs to be wrested from the occupying "Anglos." Congressman Ed Roybal, journalists Ruben Salazar, Francisca Flores and Enriqueta Vasquez, and activists Cesar Chavez, Dolores Huerta, Corky Gonzales, Reies Tijerina and Bert Corona, were all early Latino protesters against the Vietnam War. 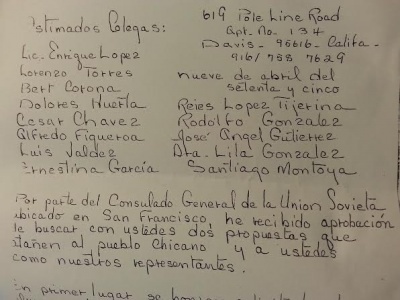 On April 9, 1975, Jorge Acevedo wrote a letter in Spanish to several well known Chicano activists including Enrique Lopez, Lorenzo Torrez, Bert Corona, Dolores Huerta, Cesar Chavez, Alfredo Figueroa, Luis Valdez, Ernestina Garcia, Reies Lopez Tijerina, Rodolfo Gonzales, Jose Angel Gutierrez, Lila Gonzalez, and Santiago Montoya. The letter referred to the Soviet Consulate in San Francisco, Chicano participation in the Patrice Lumumba University in Moscow, Chicano self-determination, the "socialist system" and the Soviet front World Peace Council. The letter spoke of two proposals received from the Soviet Consul in San Francisco. The first proposal was to invite students of both sexes to enrol in the Patrice Lumumba University in Moscow, for the academic year beginning in September 1975. "Professional and personal expenses" would benefit the socialist system, which "seeks to support the Chicano self-determination movement." Corona was listed as a Vice-Chairperson of the Committee of the National Committee Against Repressive Legislation, circa 1965. NCARL has now merged into Defending Dissent. Corona was most closely identified with the work of La Hermandad Mexicana Nacional, or the National Mexican Brotherhood. Founded in 1951 in San Diego by brothers Phil Usquiano and Albert Usquiano, the organization provided services to immigrants. Over the years, La Hermandad established chapters throughout the country and at one point boasted a membership of 30,000. The focus was organizing trade unions, defending undocumented workers, and providing social services to the undocumented. Corona quickly recognized the urgency of this group's efforts, and he helped establish its Los Angeles chapter. For the next four decades, he devoted much of his time to La Hermandad. He was the group's executive director when he died. Immigrants proved convenient for other causes and Corona brags about using them to protest U.S. involvement in Vietnam. After receiving a teaching appointment in Chicano studies at Cal State LA, Corona, whom the Los Angeles Times has described as "an energetic man with a booming voice and a Marxist-Leninist viewpoint," surrounded himself with a bodyguard of radical students. A supporter of Fidel Castro, Corona is one of the few to lament the fall of the Berlin Wall. "Renewed class struggle in these societies will lead to new forms of social arrangements," he said. "The workers of East Germany, for example, aren't about to give up easily many of the supports they had under socialism, such as low rents and free education for their children." With his stirring defense of socialism, Corona earned icon status with the left wing of the Democratic Party, becoming a hero to state politicians such as Tom Hayden, Sheila Kuehl, Assemblyman Gil Cedillo and Assembly speaker Antonio Villaraigosa, among others. He maintains a residence in Washington and has been entertained and praised by Bill Clinton. Under Corona's helmsmanship, Hermandad had become a kind of domestic Third World dictatorship in style, tactics and fiscal policy. During the later 1980's and 1990's, it secured a staggering $35 million in grants. By 1997, Corona's Hermandad was $8 million in debt, including $4.2 million on its new Los Angeles health clinic. In 1995, Hermandad was evicted from its North Hollywood office and sued for $400,000 in back rent. Rank-and-file employees complained they had not been paid and Corona, whose own lifestyle did not appear to suffer, told reporters that the group used employees' withholding taxes to pay bills, a violation of state and federal law. These derelictions did not stop the California Department of Education (CDE), headed by Delaine Eastin, former Bay Area Democratic assemblywoman, from channeling nearly $10 million in adult education funds to Hermandad. The CDE punished the whistleblowers, one of whom was threatened by Corona and his enforcers. Bert Corona and I at the 25th Anniversary of the Chicano Moratorium at Plaza de La Raza when the play August 29th was showing. Irene Tovar Three of these increible Chicanos have left us Bert Corona, Jim Raigoza and now Sal Castro. I had the honor to work with them during that era called the Chicano Movement. However the Movement is still ongoing;we need more Giants like them. In Spring 1974 , La Hermandad held a conference at Northridge, and representatives from ten states met to discuss problems confronting Mexicans in the United States who had no visas or citizenship documents. The first day, participants discussed how to defend persons detained by immigration authorities and how to help immigrants acquire disability and unemployment insurance and welfare. Over the course of the day, Corona seemed to be everywhere. If not speaking at one of the workshops, he was bustling around making sure everything was running like clockwork. The next day, participants discussed resolutions from the workshops. Corona stressed the need to establish a legislative program to campaign against bills that would crack down on the hiring of illegal immigrants and to fight for humane immigration policies and practices. This conference helped us organize at our campus and in the local community. At the same time, La Hermandad was also going through some changes. There had been an influx of student activists, professionals, and community organizers. The ideological nature of these groups brought a strong Marxist appeal, which changed the focus of the organization as Corona knew it. The newer activists wanted to deemphasize the service aspect of the organization and focus on larger ideological issues. At Northridge, there was some support from students who wanted to push a more revolutionary agenda, but many of us were not convinced how this agenda--which had its merits--would bring immediate results for the undocumented and the poor. I threw my support to Corona and to the idea that organizing could not be accomplished by polishing leftist vocabulary but rather by working hard, speaking to one person at a time, and building an organization. By 1975, Corona had moved his operation to the San Fernando Valley, where Cal State Northridge was located, so he could continue to work with the undocumented. A group of students including Carlos Ortega brought Corona back on campus for a conference to clarify how students should organize and mobilize against deportation raids and repression in general. "Present-day immigration policies and practices of the government are fundamental characteristics of the capitalist system," he said, "and the only possible way to confront those oppressing us is to organize as one, the alliance of students, workers, and the community." He added: "The student movement only has validity if directly linked with the workers' movement and the movement of people." Corona, "more than any other person, furthered the ideological struggle against the nativists," according to Rodolfo Acuna, professor of Chicano Studies at Cal State Northridge. Corona made the issue of immigration and undocumented workers, in particular, a civil and human rights concern. During the mid-1980′s, Alex Nogales co-founded an organization named HAMAS along with Frank Zuniga who was then a notable director of films. HAMAS as an advocacy group attempted to get more Latinos into the media industry by meeting with management and asking for change. However, since most of its members were working within the industry it was difficult to speak out publicly and forcefully without experiencing retaliation at one’s job. During this time, Nogalez met Bert Corona and Joe Sanchez who provided assistance and encouragement to himself and others in our struggle with the media industry. Soon, they formed the National Hispanic Media Coalition to carry out the immense work of tackling these issues of inequity that existed within the television media industry. An attorney named Armando Duron became president of the group and Nogales became vice-president. They began to acquire funding in order to develop the organization and broaden out its work. After a while, I decided that I didn’t want to work as an employee for the media any longer and have my voice stifled by retaliation so I left in order to be free to advocate for Latinos from the outside. Chicano leaders like Chole Alatorre, Roberto Martinez, Bert Corona and others were active in the Hermandad Mexicana Nacional during the 1980s to protect minorities from Klan abuses. They included Bert Corona and Soledad Alatorre, Company Directors, Hermandad Mexicana National. The organization posted a list of significant “Chicano movement” activists on its website which included Bert Corona, of MAPA. ↑ Revolutionary Activities Directed Toward the Administration of Penal or Correctional Systems, Part 4, HISC, Hearings, July 25, 1973, in part, p. 1654 and additional sponsors, p. 1655, to "A Call to a Founding Conference for a National Defense Organization Against Racist and Political Repression"
↑ LatinoPOV.com Latinos in the Media: Stererotypes, Struggles and Progress Posted on March 15, 2013 by Jimmy Franco Sr. This page was last modified on 20 December 2018, at 23:45.